Thomas said: "I was in Munich last week. A friend recommended that I go by Words' Worth (pun intended), which proved to have been a good tip. It is an unconventional place; see also the relocation warnings on their website. Apparently a sole proprietor has put together a unique collection of books with an emphasis on philosophy, human rights and media studies in the midst of his improvised stacks and sales desk. At least it is a good counterbalance to the commercial emphasis of its large-scale Munich competitor Hugendubel." 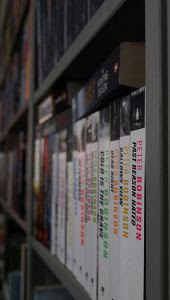 The fact that the selection of books on offer in Words' Worth is a matter of highest importance to the owners is expressed in the bookstore's motto - "Fine books for Munich since 1985". Words' Worth was created with the intention to be different than just any bookstore and to provide its visitors with something special. Through the years the name of this bookstore has come to symbolize a true haven with an exquisite selection of titles to all those who prefer to read in English. And we also have to add that it's not common for a bookstore to demonstrate the sense of humor of its owners just by its name. The stock of the bookstore comprises around 10 thousand titles. The fiction section holds classics from the English-speaking world as well as newly released titles. Books for children, Sci-Fi or mystery novels are also to be found. The non-fiction section is equally strong. You can find books in the field of social sciences (politics, current affairs, history, sociology, psychology or philosophy) as well as books on art (cinema, photography, painting) or a wide selection of biographies. In addition to books, Words' Worth also sells DVDs, audio books and lots of different gift items. British Christmas pudding or brandy butter are on offer during the holidays. The story of Words' Worth begins in November 1985 and during almost quarter century it has stayed in one street in Munich. It's been originally housed at Schellingstrasse 21, in the backyard of a 19th century building. Words' Worth has opened its second location in the spring of 2003 on the premises of Munich University's Department of English and American Studies at Schellingstrasse 3. This store was originally meant to focus especially on academic titles, but when the owners were forced to give up the original location due to financial issues in November 2006, the whole stock was moved to Shellingstrasse 3, where the bookstore resides to this day.